Mary at Pitner's Potpourri is having a linky party and giving away an Amazon gift card! Come on over and join the "snowy" fun! Erin over at Teaching with Love...in heels has a post about using shaving cream and glue to make a snowman, which prompted me to share this. In January in Georgia, we sometimes get snow. The children are always excited about snow. I play it up big time by asking how they build snowmen when/if we have snow. For the past two years, we've had enough snow to have snow days. I hope for at least one snow day every year because it plays right in to my plans! I build snowmen whenever possible, so I take loads of pictures. I share those pictures with my students along with pictures and stories of snowmen, snowladies, and snowbabies past. At least one child usually always says s/he wishes s/he could spend the snow day with me! Then I usually bring out the paint and my students take about 3 days to finish all their painting. This year, I am going to use the shaving cream and glue Erin does. They can "glob" on Day 1, then add construction paper on Day 2 to finish their snowman. Painting with several colors always takes longer so they don't mix the colors too much. I'll put painting on hold this year. 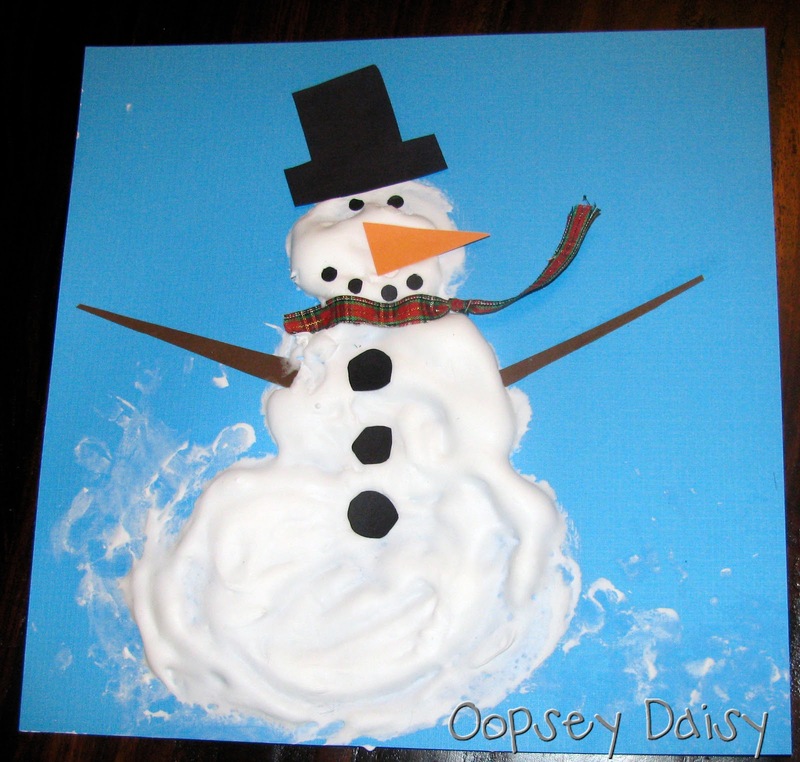 Here's another example of a Shaving Cream Snowman at Oopsey Daisy. * Mix equal parts of shaving cream and Elmer’s glue. The mixture dries puffy just like this. * Use your fingers to spread the shaving cream mixture and create your snowmen on blue cardstock. I also found Jen doing this Oil Pastel Snowman activity at Runde's Room. We'll do this one, too. I love oil pastels...have since I first used them in Art class when I was a fifth grader. So to incorporate this into my curriculum, we will write about how to build a snowman, how to glob a snowman, and how to draw a snowman using oil pastels. Writing about snowmen and all the different ways to create them helps me get my children writing three or more paragraphs in preparation for third grade. I always make a HUGE deal out of the writing. We post these on the wall outside our classroom so that everyone can see our snowmen and our marvelous writing. I also found the following recipe for which I will pick up the ingredients on my way home when they predict snow. I want to bring these in to my students after the snow so they have one more thing about which to write. I found this at Kathie Cooks. This will be our morning snack even though I never allow morning snacks with more than 7 grams of sugar! I'm sure the children will be so crazy wild excited anyway that a little extra sugar won't change things the first day after snow! You might also order one for $10.00 at Cookies for Ken to help raise money for his leukemia/bone marrow transplant treatment. It's an amazing story of love and friendship! Aren't those snowmen with the glue and shaving cream absolutely adorable! I can't wait to make them with my class after the holiday break. I love the nativity scene... a nice reminder of what this season is really all about. Merry Christmas! I just love the glue and shaving cream snowmen. When we return from winter break I'm going to have to try this with my students.